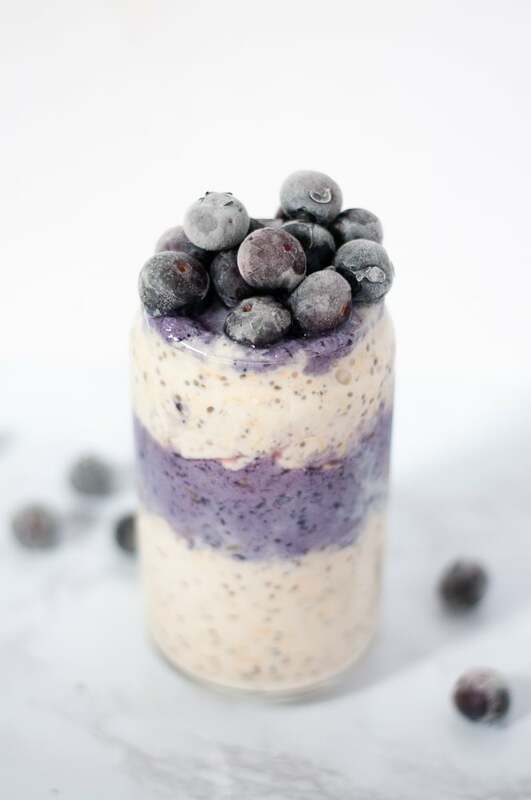 These coconut blueberry overnight oats are made with a base of coconut milk, which makes them extra creamy and delicious. 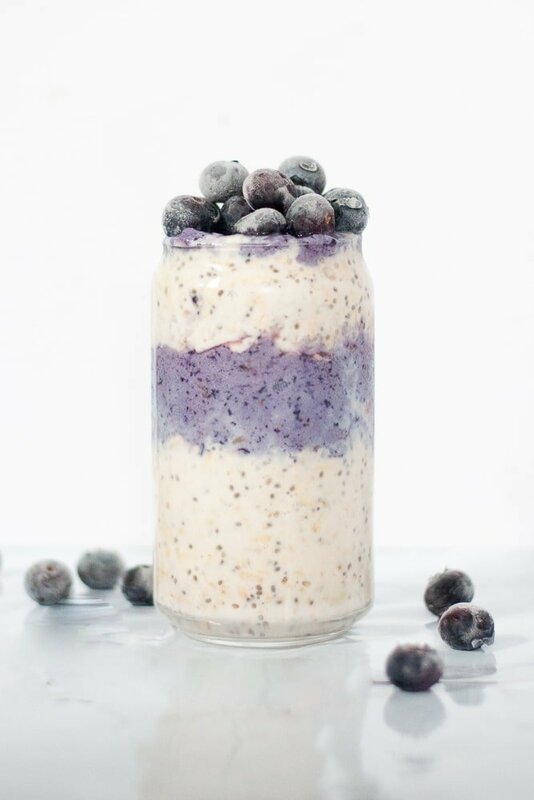 Overnight oats are perfect for meal prep and busy on-the-go mornings! I love overnight oats because they’re perfect for the lazy breakfast eater. There’s nothing better than waking up and grabbing a ready-to-eat and nutritious breakfast straight out of the fridge! Although overnight oats are usually made at night (hence the overnight part), you only actually have to wait three hours to eat them. Sometimes I make overnight oats when I get home from work, throw them in the fridge, then eat them a few hours later for a night time snack. 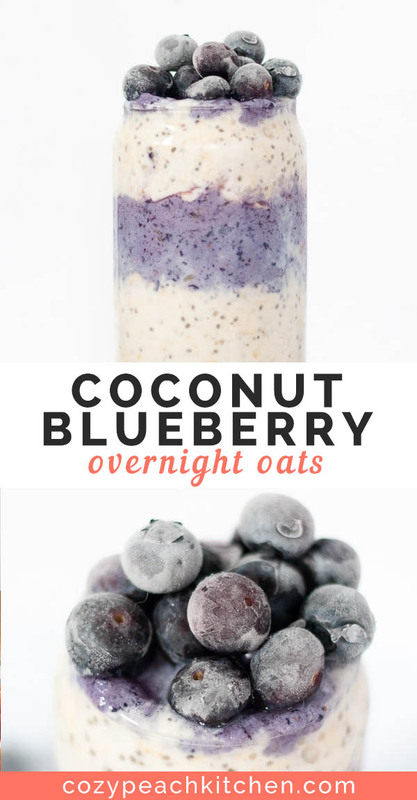 Don’t let the name trick you into thinking overnight oats are only meant for breakfast! Do you eat overnight oats hot or cold? This is the age old question, and one that I think comes down entirely to preference. For me, it’s all about the season and the flavor of oats. Spring or summer? Cold. Fruity and tart? Cold! Fall or winter? Hot. Cinnamon-y and aromatic? Hot! 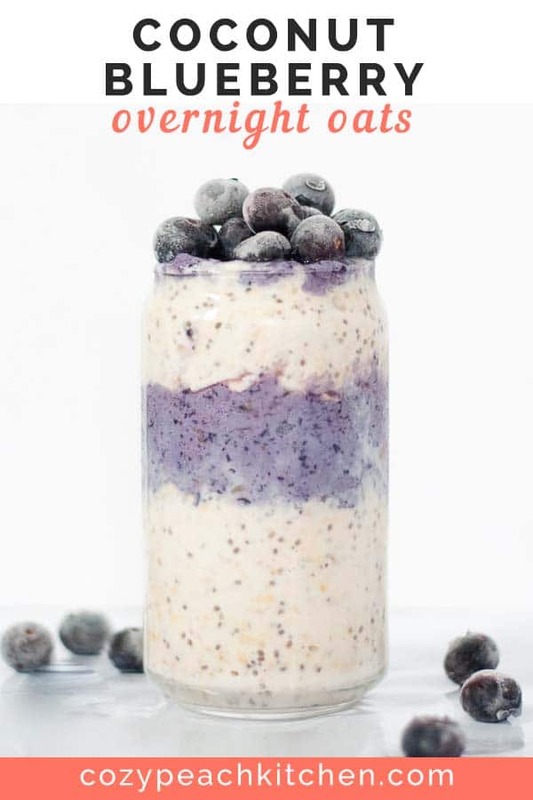 Coconut blueberry overnight oats? I choose cold, but hot is just as good. It all boils down to preference, as always! The best part about overnight oats is that they’re delicious at whichever temperature you choose to eat them at. For hot oats, I just heat them up on the stove on medium-high heat for 2-3 minutes, until warm. 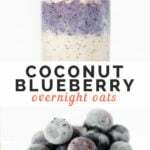 How do you make coconut blueberry overnight oats? 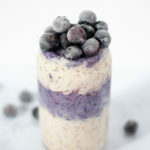 For these coconut blueberry overnight oats, I puree a handful of blueberries in a blender, then mix them into the overnight oats mixture before refrigerating them. The oats soak up some of the blueberry flavor while they’re resting, so you get a naturally sweetened oat mixture. The liquid in these oats are 50/50 coconut milk/other milk. Coconut milk is naturally high fat, which makes a super smooth and creamy texture. I prefer to use reduced fat coconut milk in most of my cooking, because it cuts down on the majority of the fat content while keeping a lot of creaminess. You can choose any kind of milk you prefer for the other half of liquid, such as: soy milk, almond milk, oat milk, hemp milk. My personal favorite is soy milk, because of flavor, mouthfeel, and nutritional content (it is higher in protein than most other plant based milks). Chia seeds are a go-to addition in all of my oatmeal bowls. They thicken up the oats a bit more and add a great punch of nutrition: fiber, protein, and various vitamins and minerals. My favorite part of breakfast bowls is…toppings! These overnight oats are great for meal prep. 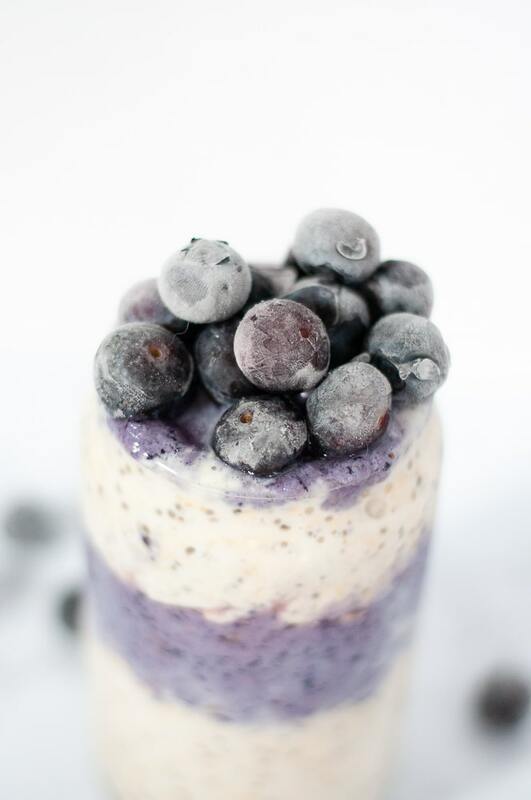 They're creamy from the coconut milk and naturally sweetened with pureed blueberries. Stir together all ingredients in a medium bowl. Divide into two pint sized (16 oz) mason jars. Cover and place in fridge for at least three hours, or overnight. Remove from the fridge and stir to break up clumps. Add additional milk and sweetener as needed. Enjoy hot or cold!